Sometimes you see juniors switching from metal to metal, trying to catch the flavor of the day, riding the hypes with basically worthless projects. So now diamonds are out of favor, and gold is back in vogue, could it be that Margaret Lake Diamonds (DIA.V) is pulling the same trick with their latest acquisition? There are two important factors opposing this possibility in my view at least. First and foremost there is exploration legend Buddy Doyle who didn’t only discover diamond deposits but also 15Moz of gold deposits in the past. This all star geologist has a serious reputation to lose. Furthermore he isn’t the person to give away anything easily, as I experienced first hand when I tried in vain to assist with a financing of a UK fund at the end of 2013 for a cash strapped Amarillo Gold, where he was the CEO at the time. The money was on the table, but he refused to surrender to the pretty tough terms. I found it to be a pretty bold action at the time, but I also have to give him credit for being adamant on the share structure. The second factor is the new Kiyuk Lake gold project itself, located in southern Nunavut, being acquired at the moment. Although nordic and remote, not too often do you see drill results like 249m of 1.6g/t almost from surface, and a serie of good results from 35-188m, meaning there could be significant open pit potential. With Doyle as VP Exploration endorsing this project, the company seems to have a good chance of finding out what exactly this potential could be. Margaret Lake Diamonds Inc. (TSX.V: DIA) is a Canadian junior mining company focused on mineral exploration in Canada’s most prolific nordic mining districts. 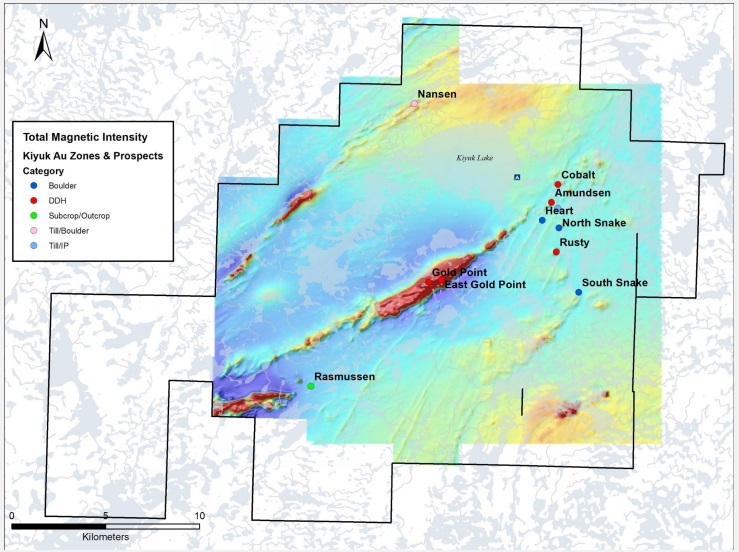 The company is earning in an 80% interest in the soon-to-be flagship high-grade Kiyuk Lake Gold Property located in southern Nunavut. They are optioning it from Cache Exploration (CAY.V), another tiny explorer, who can’t raise the necessary cash to advance it meaningfully. 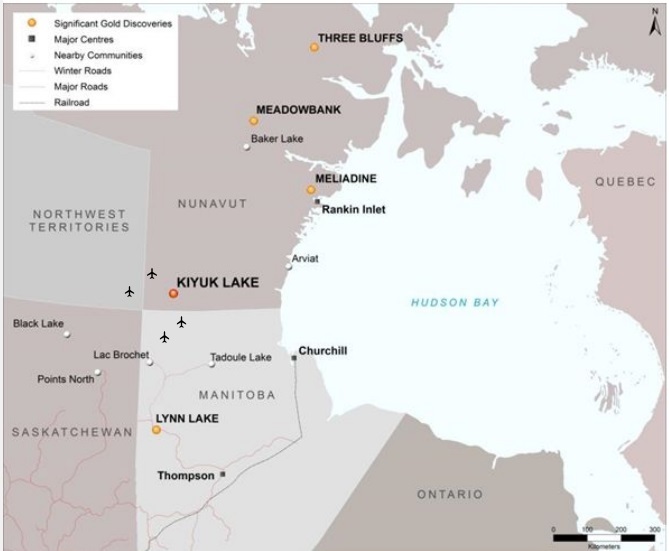 It also holds interests in two diamond exploration properties in the Northwest Territories, the first being the Margaret Lake project located adjacent to Mountain Province Diamond’s Kennady North project and close proximity to Gahcho Kué, the newest Canadian diamond mine owned by De Beers and Mountain Province Diamonds. The company also has a 60/40 joint venture with Arctic Star Exploration Corp. (TSX.V: ADD) to explore the Diagras property, which is comprised of 23 claims totaling 18,699 hectares located in the prolific Lac de Gras diamond field. Management is fully focusing on Kiyuk Lake now, and so will I in this article. The management team of Margaret Lake Diamonds is an interesting collection of characters. Leading the pack is new President and CEO Jared Lazerson, coming on board at December 17, 2018. I know Jared as the CEO and wild & visionairy deal maker, marketing specialist, trader and money raiser of advertiser MGX Minerals. Sometimes he is a tough act to follow and MGX Minerals is going through a rough period now as they face delays on their wastewater pilot plants, but he did raise over $30M for MGX in 2 years, so at the very least he has backing of some powerful players. One of the first things he did when coming on board was buying 4M shares of Margaret Lake Diamonds in the market, so it is safe to say that management has skin in the game here. As mentioned earlier, VP Exploration Buddy Doyle is somebody who doesn’t really need much introduction, but to be fair he led the team that discovered the Diavik Diamond deposits in the nineties, and was the former Exploration Manager for Kennecott/Rio Tinto. Mr. Doyle is recognized by his peers in the exploration industry as an authority on diamond exploration and kimberlite geology, and has authored/co-authored numerous papers on these subjects. He was awarded the 2007 Hugo Dummitt Award for excellence in Diamond exploration. Before all this, he was a key member of the team that discovered the Minifie deposits, that formed for the most part the monstrous Lihir Mine at Papua New Guinea, currently owned by Newcrest, which produced 0.955 Moz Au in FY 2018. Another remarkable person on the Board is Don Huston, who worked for a decade in the family exploration business, and has had a 20 year long career after this in putting together and promoting mining deals for the last two decades or so, one more successful than the other. He is a director of 3 other junior mining companies, and lately he also has been involved in a blockchain deal called CUV Ventures, rolling out a blockchain based credit card application on Cuba. Another director is Darryl Sittler, a former NHL player and 1989 inductee to the Hockey Hall of Fame, also director of Frontline Gold and Wallbridge Mining. From my experience, these former sport legends in business usually have an excellent, slightly different network in the circles of power and finance, and can be a real value-add. The company has appointed Dr. Michael Reimann (PhD) as CFO, which is a familiar name from MGX Minerals. The company currently has 54.69M shares outstanding (fully diluted 63.65M), 8,96M warrants (C$0.20 exercise price, expiring on April 16 and May 31, 2021) and 2.05M options on average @ C$0.14, most of them expiring after October 1, 2021. Margaret Lake Diamonds sports a very tiny market capitalization of C$4.38M based on the April 15, 2019 share price of C$0.08. The company is looking to do a financing very soon, looking to raise about C$2M in order to get their exploration program for Kiyuk Lake going. The company is basically controlled by management, as 45% is held closely by management, Board of Directors, insiders and former insiders with no intention of selling anytime soon. Former CEO Paul Brockington, who made a fortune by early investments in diamond plays like Diamet and Aber, owns directly and indirectly 11.6M shares (21.3%), CEO Jared Lazerson owns 4M shares (7.5%). Brockington is holding on to his shares according to management. The new gold story has slowly started to find its way to the market since mid February as can be seen by the first uptick in the chart, and rightly so as a share price of C$0.035 isn’t very useful to raise cash. I expect several catalysts in the coming weeks/months, so this could prove to be a nice entry point, especially considering the exploration potential, which I will discuss in the next paragraph. The Kiyuk Lake gold project will be the sole focus of this article as mentioned, as management does the same now. On a sidenote, diamond exploration is many times more difficult as the diamond hosting rocks (kimberlites) are usually present in relatively small kimberlite pipes, which have to be detected first, and after this the exploring company has to actually hit diamonds, which are of course discrete, very tiny gems, widely spread in kimberlites, needing wide diameter drilling etc. The costs versus chances of success are much more disadvantageous compared to (precious) metal exploration, which is already difficult enough as it is, with an estimated 1-3 mines put into production out of every 1,000 exploration projects. Kiyuk Lake has seen quite a bit of exploration in the past, beginning with Newmont Mining in 2008 and most recently Cache Exploration in 2017. This has resulted in over 13,000 meters of core drilling and identified four mineralized zones and five additional high priority target areas that have yet to be drill tested. 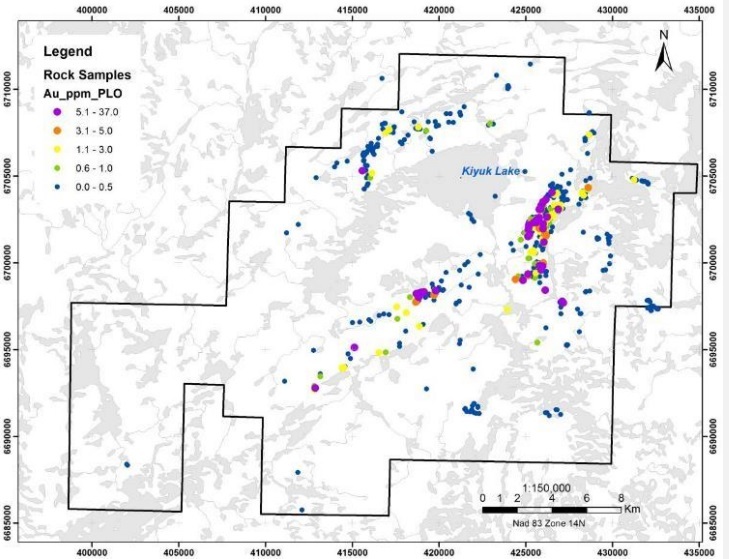 Mineralization has been traced across a 13-kilometer strike length and remain open in all directions. When I looked into the history of Kiyuk Lake, I noticed a few big names and companies being involved over the years. Quinton Hennigh basically discovered it, and was the geologist handling the project for Newmont and Evolving Gold, and Hennigh and Adrian Fleming oversaw the drilling for Prosperity Goldfields, to name the most important ones. Since Prosperity Goldfields, there have been 3 different owners, and Margaret Lake Diamonds will be the fourth in 6 years time. This is a bit much in my view, so you might ask yourself, like I did, are we dealing with a recycled project here, doing the rounds again in the next potential gold bull market after being under the radar for several years? Not exactly, there is more to it. Newmont sold the project in 2008 as they parted with most of their exploration projects at the time because of a change in strategy. Evolving Gold picked it up, did extremely well by the way in a raging bull market at the time, and Kiyuk Lake was spun out into Prosperity Goldfields in 2010. Prosperity was quite active with their exploration program, but they ceased drilling in 2013 as the entire resource space entered one of the most severe bear markets ever seen after 2012. After this the project changed hands two more times, as Northern Empire and Montego owned it as well. Cache Exploration came along after 4 years, and bought the project in 2017 as it was sitting shelved. This buying was predominantly caused by Robert Bick, VP Corporate Development, who knew Kiyuk Lake from his time as the CEO of Evolving Gold, and didn’t forget about it. Cache Exploration raised some money and drilled a number of impressive drill holes, but had difficulties raising enough money to provide the amount of drilling necessary to really advance Kiyuk Lake towards a resource in a reasonable timeframe. And let’s not forget, drilling up north is expensive, to the tune of $600-750/m, as everything has to be flown in and out at Kiyuk Lake. I talked to a few people with close working knowledge of Kiyuk Lake, and the general message that was conveyed was the gold was there, although hardly economic yet because of the remote, nordic location with no infrastructure. The intercepts and grades so far indicated a very interesting project, and they believe it has great exploration potential. They believed for an economic project in that location, 2Moz @ 1.8-2g/t Au open pittable is necessary at current gold prices. On a sidenote: many people look at nordic projects like Back River from Sabina Gold & Silver (SBB.TO) with a mill feed grade of 5.7g/t Au for comparison, but let’s not forget Back River has a high strip ratio of 7.2:1 as well, and Kiyuk Lake seems to have much less than that at the Rusty Zone, although it still is early stage on just one target. So the bottom line seems to be for Kiyuk Lake that the gold seems to be there, but it is expensive to explore, so it advances relatively slowly with each drill campaign. 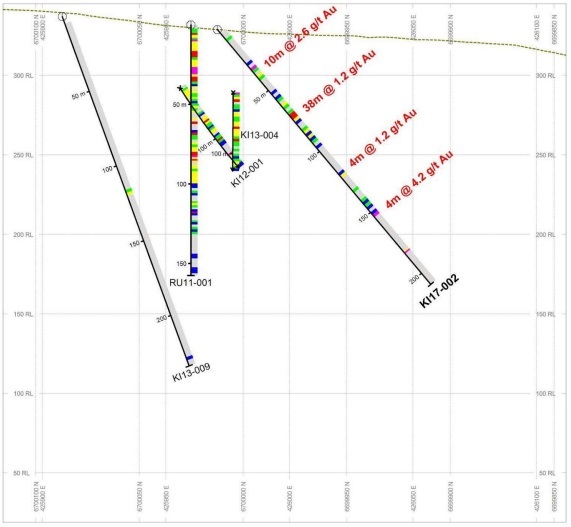 It is up to Margaret Lake Diamonds now, to take Kiyuk a step further (and hopefully more) and deliver the first resource estimate of hopefully 1Moz Au, on their way to the coveted 2Moz Au. According to the relevant news releases, these intercepts are not true width, and have not been verified recently by a qualified person as per NI43-101 regulations. 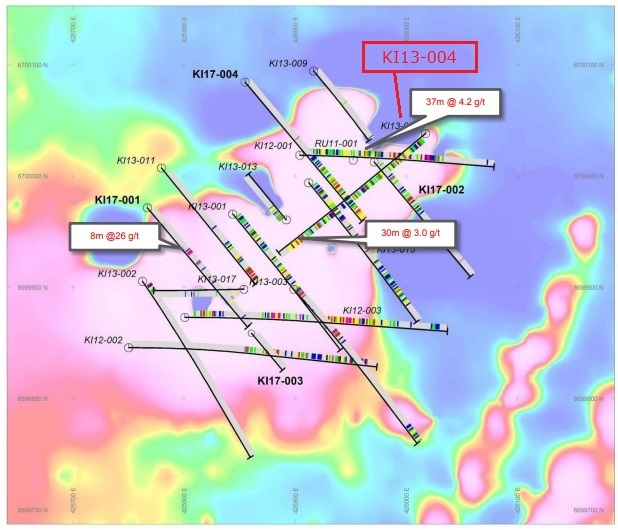 Notwithstanding this, there is no denying that these are all very interesting drill results, indicating solid resource potential. Considering the average grade, we should look at open pit potential, and this is usually limited to a depth of 200-250m. Economic open pit grade usually begins at 1-1.5g/t Au, and I can see this going to 2-2.5g/t for Nunavut like nordic regions. The geologists I talked to see 2g/t as a minimum grade for Kiyuk as well. Besides this, for underground mining, economic grade starts at 6-7g/t at US$1300/oz Au, and this far north it could go to 9-12g/t. 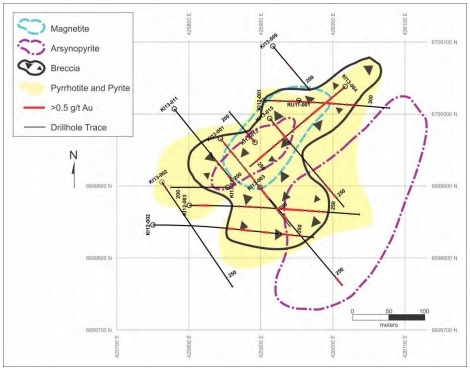 Figure 60 – Conceptual cartoon, based on core logging information, of the Rusty Zone outlining magnetite and sulphide zonation with respect to gold values. Arsenopyrite is found in the core of the gold zone but primarily on the outer edge of gold mineralization and out into the magnetic low to the east of the Rusty Zone. The breccia zone encompasses a majority of gold intersections. Magnetite makes of the core of the zone with a sulphide halo extending around the magnetite core. Figure 61 – The core of gold mineralization in the Rusty Zone is defined by actinolite and carbonate alteration as seen in this conceptual cartoon based on core logging. Quartz alteration and veining is found on the periphery of the Rusty Zone. 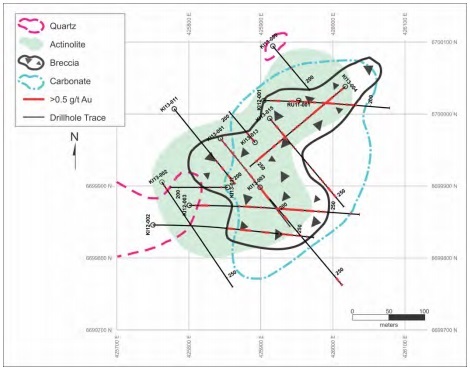 Figure 62 – Cross sections showing mineralization and alteration zonation in the Rusty Zone with respect to gold grades above 0.5 g/t Au. Breccia zones are important for gold mineralization and show a strong correlation in this cross section. The sulphide halo surrounding the magnetite core can be seen. Gold occurs in both the magnetite and sulphide zones. Arsenopyrite is often found in the magnetic low to the east of the main Rusty zone. Gold is intersected in these zones rich in arsenopyrite. However, grades are commonly below 0.5 g/t Au. Actinolite and carbonate alteration make up the primary alteration minerals seen in gold zones. Carbonate (calcite and dolomite) does have a broader alteration halo as shown in the cross-section. Quartz alteration is seen distal to the main breccia bodies and gold zones. 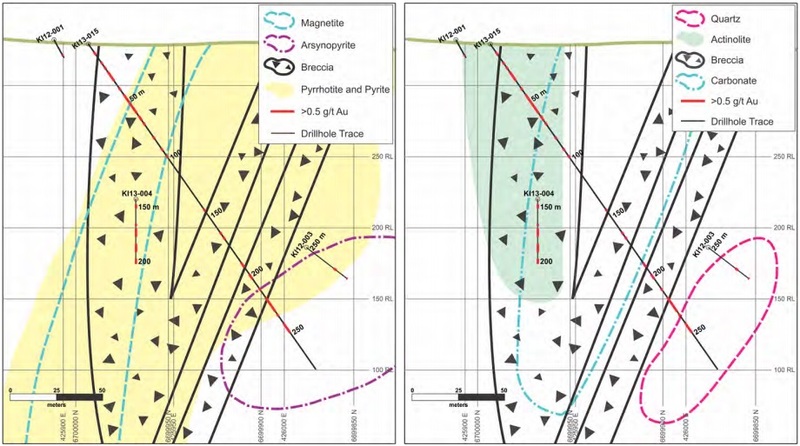 The gold mineralization starts at surface at Rusty, more to the north-east of the drilling area (see magnetics map), and seems to continue at depth. 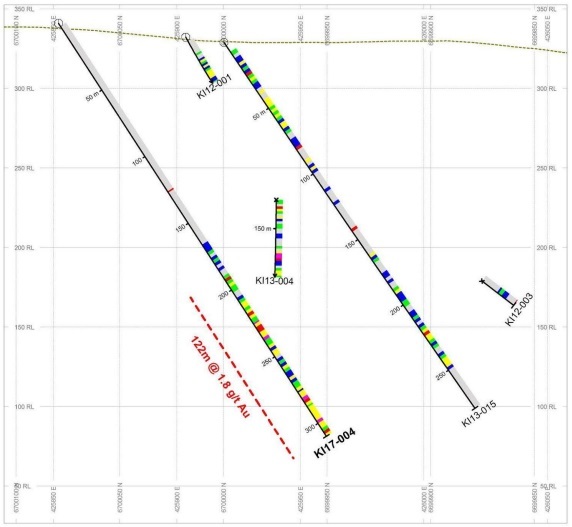 When looking at the drill results, maps and sections, I guesstimate a global mineralized envelope of 4.5-5M cubic meters (m3), with a specific gravity of 2.85t/m3 (per the internal technical report, p. 119) this results in 12.8-14.25Mt tonnage. At a conservatively estimated average grade of 1.6g/t Au, this would result into 0.66-0.74Moz Au, every increase in average grade of 0.2g/t Au this would add 0.08-0.09Moz Au. Margaret Lake Diamonds is aiming at 1Moz Au for starters, and this doesn’t seem unrealistic. An average grade of 2g/t Au would be a good thing, and they are fortunate not to have a high strip ratio. I estimate this at 3-4:1 which is good, as the usual open pit strip ratio is more like 4-5:1. If they do manage to get to a 1Moz @2g/t resource, I believe they have a solid base to build on from there. It is up to Buddy Doyle and his team now, to plan an exploration program. CEO Jared Lazerson is raising money at the moment, and has applied for a Land Use Permit at its Kiyuk Lake Gold project located in southern Nunavut. Currently, Kiyuk Lake has a Type B water license that is valid until June 2022. The Type B license allows the company to access local water sources for camp and drilling use. Margaret Lake Diamonds finally switched from diamonds to gold with their new flagship Kiyuk Lake Gold project in Nunavut, and it might be a gamechanging event. Incoming CEO Jared Lazerson knows he has quite a task on his hand up north, but he loves to explore and he told me he missed the adventurous exploration times in the bush with his dog and the helicopters, so he was eager to acquire the Kiyuk Lake Gold project and make plans with Buddy Doyle and the team. 1Moz Au is a clear target for the maiden resource estimate, and doesn’t seem unrealistic at all considering the earlier results. Let’s not forget the very tiny market cap of C$4.38M, even if not economic at the moment, a potential 1Moz asset would be very unusual for such a low valuation, even as a leveraged play on gold, and there seems to be much more exploration potential at Kiyuk Lake. I am a curious follower of this interesting story.